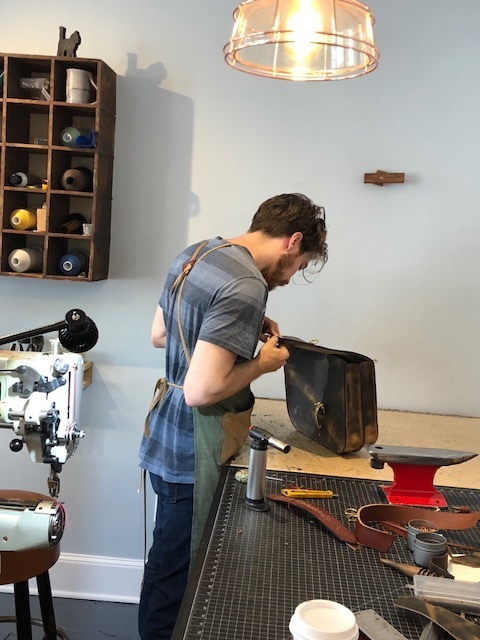 Blackkat Leather started as a hobby and has expanded into a small business. Every bag, wallet, and belt is cut and sewn by hand; ensuring a product that lasts forever. Cassandra and Drew Archer started the business in Santa Cruz, California and have now established Blackkat in Chester, CT. Inspiration for the name comes from our black cat Roro (Rohan) who is always close by while we are working tirelessly in the workshop. Blackkat focuses on the quality, sustainability, and functionality of all our products. Consumerism has become the norm and handmade quality goods have become few and far between. Our products are each designed and crafted with simplicity, classic styling, and the highest quality materials to create a product that will be used daily without wearing out or falling out of style. We are always looking for new ideas for leather products. Feel free to contact us with comments or requests for custom designs. One of our dreams had always been to open our own shop, and in October of 2016 we did just that! Blackkat Leather storefront is located at 1 Main Street in Chester, CT. Chester is a vibrant community with a quaint downtown main street that boasts many art galleries, boutiques, restaurants, and a farmers market on Sundays. All of our current designs are featured at the shop as well as new designs not yet available on the website. We also offer custom work and repair services for bags, belts, and accessories. Other local artists work are also displayed within the store; creating a unique variety of handmade goods. Please come by for a visit! Store hours are: Wed - Saturday 12pm-6pm, Sunday 10am-2pm.